Glass walls enclose the owner’s wine cellar, offering guests a view at the contents inside. First floors are fine for formal dinners and family time, but when you want to get serious about games, movies or parties, consider taking it down a level. 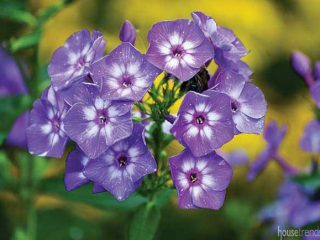 Today’s basements offer options that are appealing to just about everyone. Here, you can belly up to the bar, take a cue at the pool table, pour a tasting in the wine room, or plop on the oversized sectional and take in a movie. Take a look at seven separate spaces that might inspire you to add extra layers of recreation into your own rec room. 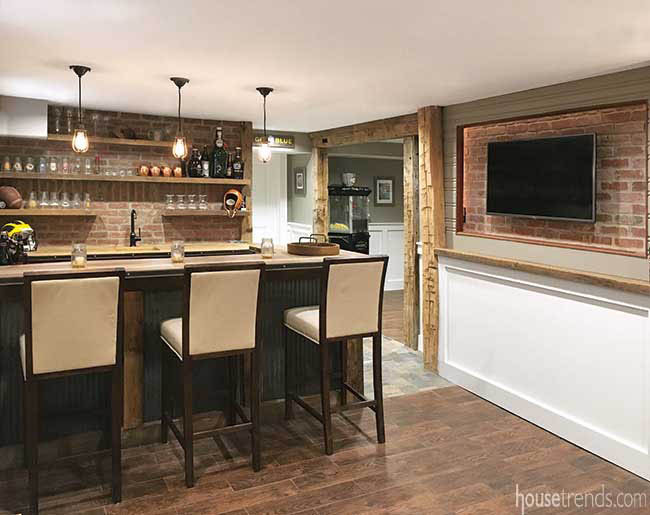 A Powell bachelor, who had an existing theater room in his lower level, wanted to add a pub-style reception area of sorts where guests could gather for a pint or a bite at the bar. Kitchen cabinets were repurposed from an earlier upstairs remodel and the island was faced with radiator cover screens for a vintage, industrial twist. On the opposite side of the space, there’s plenty of room for wine tastings and card games. Plus, this movie buff’s bonus is a James Bond-inspired hidden room that is accessed through a secret passage behind the built-in bookcase. 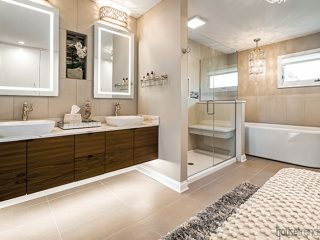 This lower level in the Worthington area was designed with adults in mind, rather than as a space for the kids to play in. The style of a more traditional first floor is left behind as guests enter this handsome and slightly rustic retreat. In a striking corner room, glass walls reveal the owners’ wine collection, while stone columns cleverly conceal multiple support posts that were inherited from the original space. 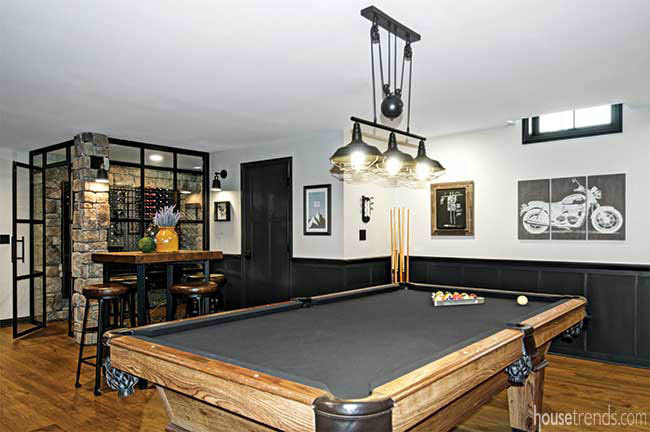 The rest of the cozy area offers up options for playing a game of pool, relaxing in front of the television, or enjoying a drink from the custom-built bar. 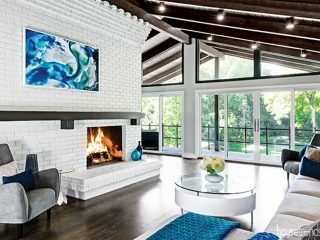 The fireplace is about the only recognizable feature from the original basement of this Worthington home built in 1939. A rotted hardwood floor was replaced with a poured concrete base, then covered in porcelain wood-look tile. Due to plumbing updates, the ceiling was replaced as well. Multiple closed-off rooms were reconfigured to yield just two primary spaces—a great room and a pub. 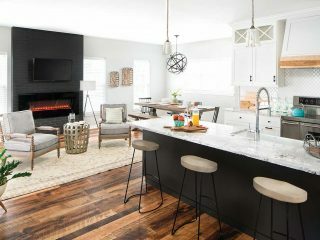 Finish selections add a decidedly rustic touch: The mantel is topped with chiseled edge stone and reclaimed barn wood. 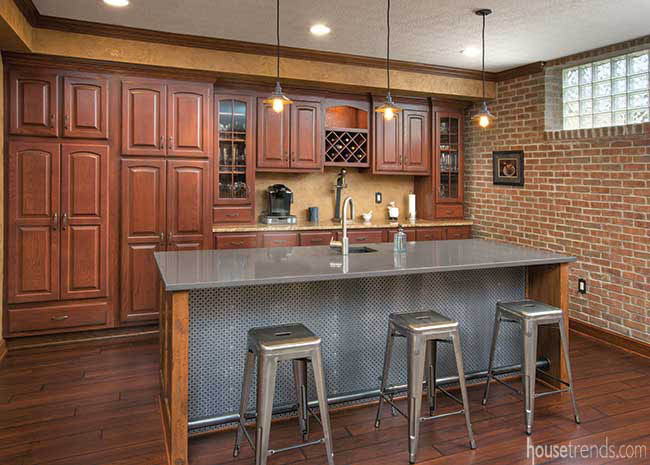 The bar area features a brick veneer, a hand-hammered copper sink, and a copper penny backsplash that serves as a great conversation starter. Resources: Designer Bryce Jacob; Contractor J.S. 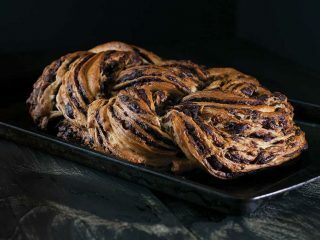 Brown & Co. 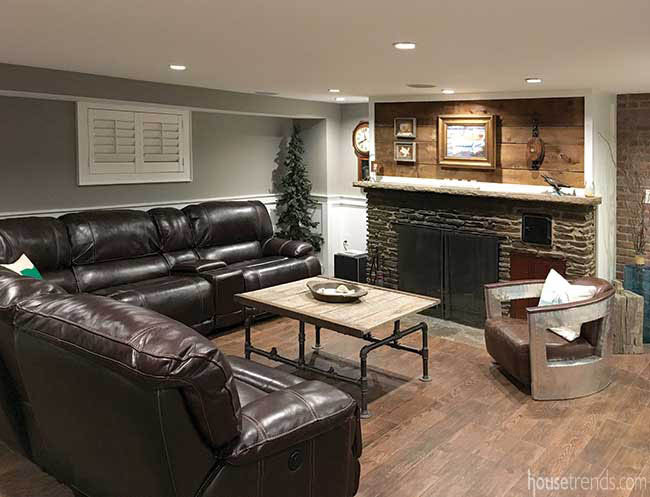 When remodeling their unfinished basement, a Worthington couple wanted to keep an open floor plan that didn’t restrict usage of the large space. So furniture placement was used to define the rooms rather than walls. 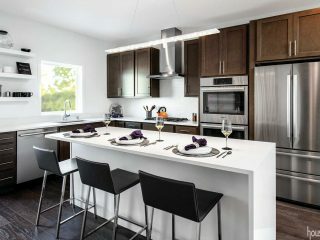 Instead of a fixed island in the kitchen area, the designer placed a movable high-top table, creating flexibility that was appealing to the owners. 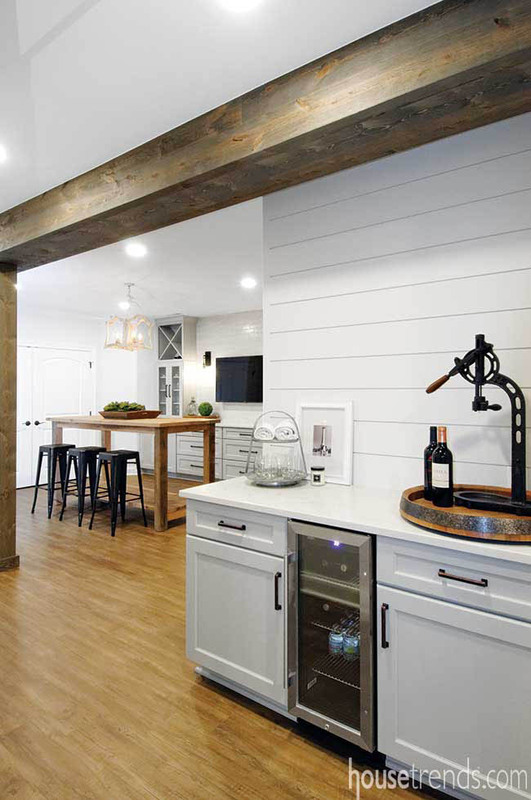 To add a bit of farmhouse flair, a steel support beam was wrapped to look like barn wood and shiplap was placed to highlight accent walls. A large storage closet was added to house the owner’s extensive collection of holiday décor and party supplies. 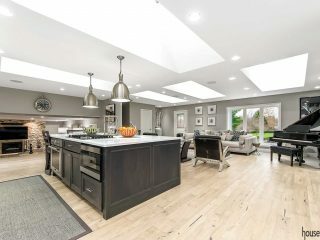 Originally built for the 2016 Parade of Homes in Powell, this lower level of a five-level-split home actually has a basement level beneath it. This floor hosts an entertainment area complete with a pool table and a quartz-covered bar space with a convenient storage room behind it. Elegant light fixtures by Fredrick Ramond drop from a black ceiling to make the engineered bamboo floor—also finished in black—glow. On the opposite side of the room there’s a sitting area with a wide set of windows that look out onto an outdoor patio. 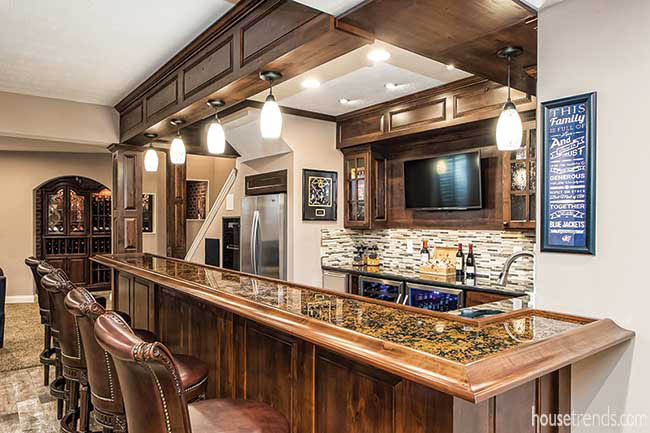 When a Powell couple wanted an entertainment area for large gatherings of family and friends, they turned their attention to their lower level. The goal was to create a space adults and children could enjoy together within an open floor plan. 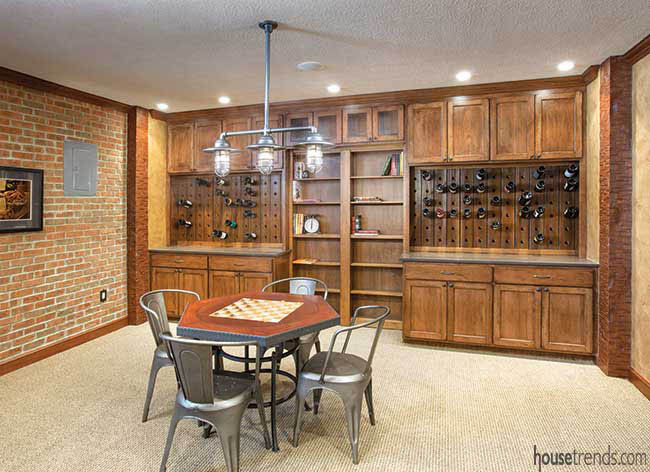 Inspiration for the grown-up get togethers began with a wine room idea the couple had in mind. 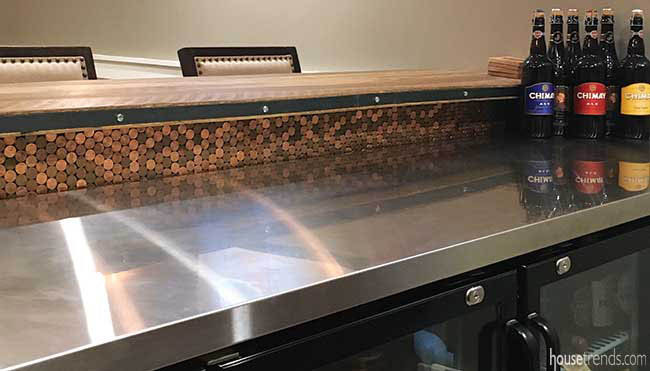 To get the look they wanted in the adjoining bar area, Joe DeCenzo and his team installed handmade hickory cabinets and an inlaid bar top with a striking copper patina. 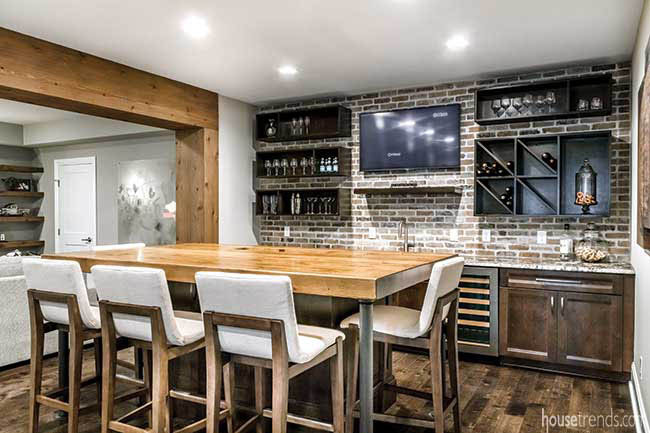 Raised panel columns conceal support beams, and wine refrigerators are equipped with locking systems for a level of security. The designer’s use of brick and natural wood helps create a warm, inviting feel in this Jerome Village lower level. 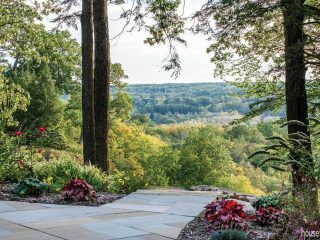 Built as a show home, this space was designed to give visitors a first-hand look at the many different ways these expanses can be configured: as an entertainment area, exercise space, media room, and more. 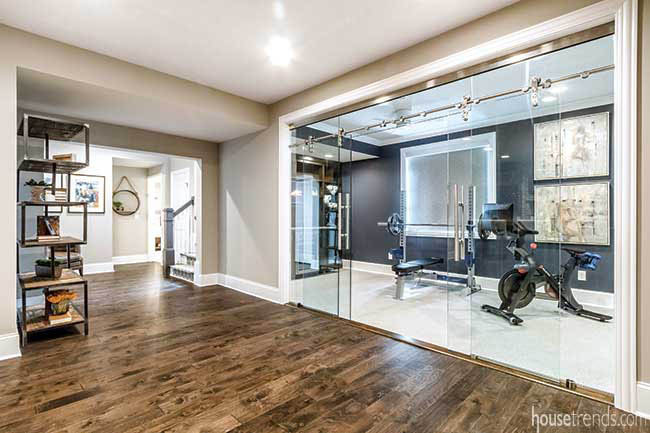 Flooring selections define the different uses–carpet in the bedroom, tile in the bathroom, recycled rubber interlocking tiles in the gym, and engineered hardwood in the entertaining areas. A wood island, which comfortably seats five, provides the perfect spot for an afternoon sports gathering or an evening of wine tasting.